Primary human papillomavirus (HPV) screening is a new way of examining cervical screening (smear) samples, where the check for HPV is the first test carried out. Evidence points towards a reduction in cervical cancer with this way of screening compared to the current method, which is to look at cervical cells first in a laboratory (a process called cytology). Primary HPV screening will be rolled out across the NHS Cervical Screening Programme in England by the end of 2019. In 2013, 6 laboratories in England began looking for HPV in samples first to assess the best way of introducing HPV primary nationally. Early results helped to inform the UK National Screening Committee (UK NSC) recommendation in 2016 to implement primary HPV testing to replace the cytology test. The pilot also advised commissioners and providers of cervical screening services who are implementing primary HPV screening. The main results from this pilot have now been published in the British Medical Journal (BMJ). 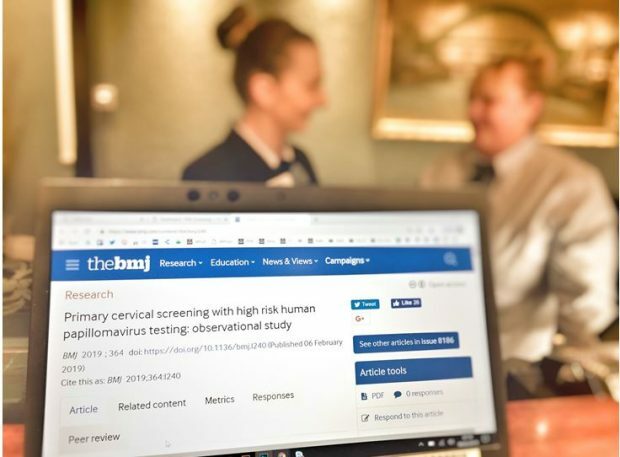 The results from the pilot and other studies point towards a reduction in cervical cancer following the full introduction of primary HPV screening. These positive results provided the independent expert screening committee with further evidence to support the recommendation that the HPV test should replace cytology as the primary test performed on all screening samples. This large study carried out over many years helped us gather information about what happens when HPV primary replaces cytology in the screening programme.